Fibre - it's the future doncha know? 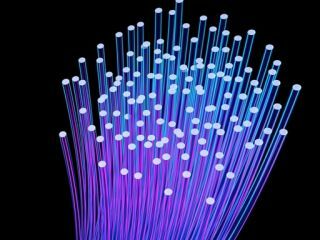 A project by the North West Development Agency will provide Manchester with a synchronous 100Mbps fibre optic network – and could serve to show how important a decent infrastructure could be to the UK. The publicly funded £1m project will serve 1,000 homes and 500 businesses, and will offer an insight into how future networks will operate. "It will allow home working, telemedicine, video calling and net-based services on TV," explained Chris Smedley, Chief Executive of Geo, the company appointed to build the network. The real headline grabber is the speed of uploads – with even Virgin Media's excellent 50Mbps service not offering anything like a synchronous upload speed that will offer uploads as fast as downloads. Virgin Media is testing a 200Mbps service at the current time, although Shaun Fenson, an advisor to the Manchester Digital Agency, rather curiously told the BBC that neither this nor BT's super-fast fibre optic offering constituted "true next generation services". "The hope is that networks such as this will successfully spread. BT will lay fibre in some places and communities in others," said Fenson. "The job then is to make sure that all the networks are interoperable." It's not hard to see how a fibre-optic infrastructure is critical to the UK's industry, so this kind of project can only help bring about the next generation of connectivity – especially with the news that Britain is only 26th in global average broadband speeds.